As the title implies this challenge is quite easy. Just write down one thing a day that you’re grateful for. We’ve even given you a nice little printout sheet to do it on plus some reminders you can make to put around the house. The only requirement is that this activity must be done with thought. None of this quickly writing down the standards to fill a slot. You have to ponder your choices and they have to be things that make your heart swell up when you think of them. That’s what true gratitude feels like. We know that you’re most likely thankful for your spouse, children, God etc. Those are givens. Try to go deeper with this challenge. For example rather than “family” choose a specific family member and WHY you feel grateful. i.e. I’m grateful for my daughter because of how kind she is to strangers and never judges anyone. Or, I’m grateful for my husband because when I’m feeling bad he always does silly things to make me smile. Get the picture? Remember: You can’t just think about what to write down. You have to FEEL it. I’m sure you’ve heard about how important gratitude is. That’s not just a made up idea to get people to be nicer. Being grateful has a physical and emotional effect on your body and overall life. Though many studies have been done on this subject, Professor of Psychology, Robert Emmons is acknowledged as the pre-eminent expert on gratitude. He’s done experiments on gratitude for more than a decade and the results are amazing. “Gratitude is one of the few things that can measurably heal, energize and change people’s lives. It is a turning of the mind, not what I don’t have, but what I have already.” Dr. Robert Emmons This 4 minute video explains what gratitude can do for you and what the studies have found. It’s a scientific fact that people who express and feel gratitude on a daily basis are happier, and happier people live longer, make more money, have less illness, sleep better, are more resilient, have better relationships, are less stressed, are overall healthier, have better outlooks, get better grades, make better decisions, exercise more (because they want to), have better self-esteem… to list a few. 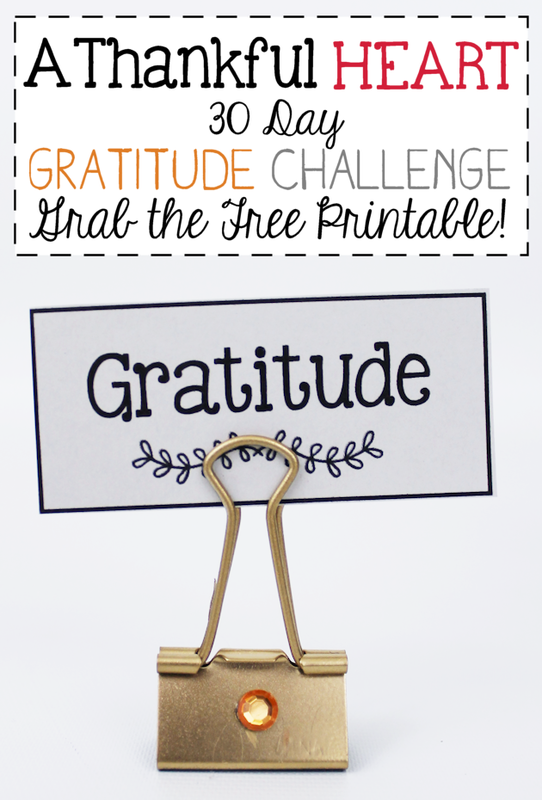 Each day write something down on the free pages below that you are truly grateful for . 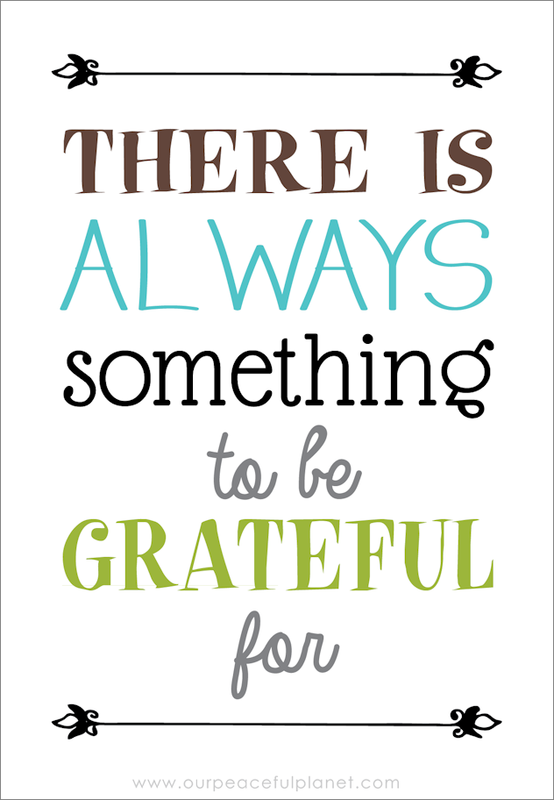 You cannot just think about what you are grateful for. You must FEEL it deeply. Ponder your choices and choose things that make your heart swell up when you think of them. That’s what true gratitude feels like. For example, we know that you’re most likely thankful for your spouse, children, friends etc. Try to go deeper with this challenge. Rather than “family” choose a specific family member and why you feel grateful. i.e. I’m grateful for my daughter because of how kind she is to perfect strangers and never judges anyone. Or I’m grateful for my husband because when I’m feeling bad he always does silly things to make me smile. CALENDARS There are two calendar sheets provided. One is a guided sheet in which you are given a topic. The other is blank which lets you choose your own topic. (You can use the guided calendar sheet for ideas.) FOLLOW UP After your month of diligently doing this, determine if you feel better overall or not. If you truly did it with feeling, you will. Post this list somewhere you can see it regularly as a reminder. 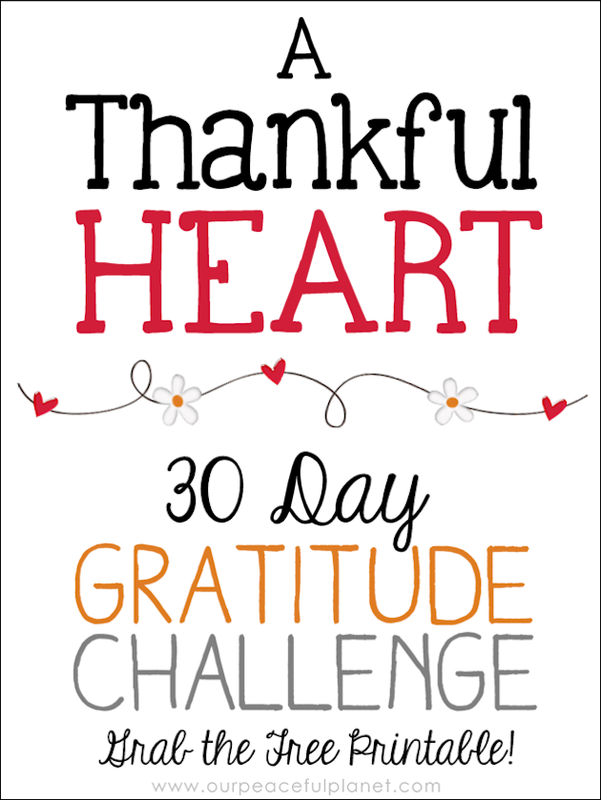 So get out there and practice deliberate gratitude for 30 days! And you know what they say about doing something for 30 days… it becomes a habit! 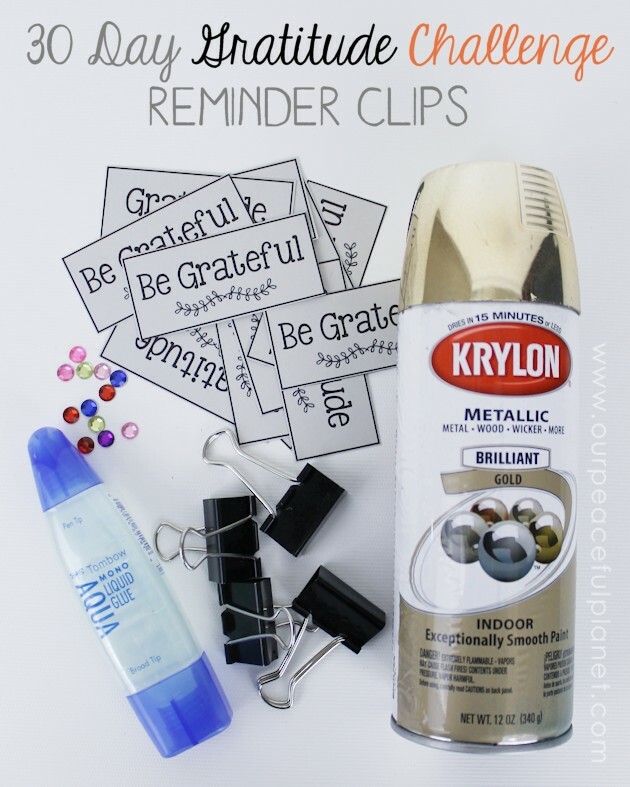 To help you remember to be grateful, print out the tags provided in the downloadable kit and make some simple binder clip holders. Then place your reminders around the house where you’re sure to see them! You can decorate these however you want but we kept it simple. Glue a small charm in the center. Print out the free reminder cards on colored cardstock of your choice. We used gray. Cut out and place in your clips as shown. 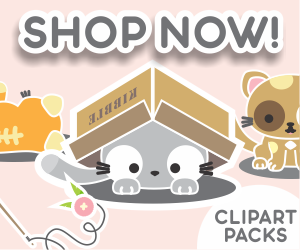 I love the golden paper clips!! Such a fun and pretty idea! Now I know what I’ll do with my XXL ones!! 😉 Thank you also for the free downloads!! Thank you so much for sharing at my craft party on Thursday! Hope to see your newest posts this week, which starts at 7pm EST. I was kinda fond of those paper clips too. Ü Appreciate you stopping by! What a wonderful post! 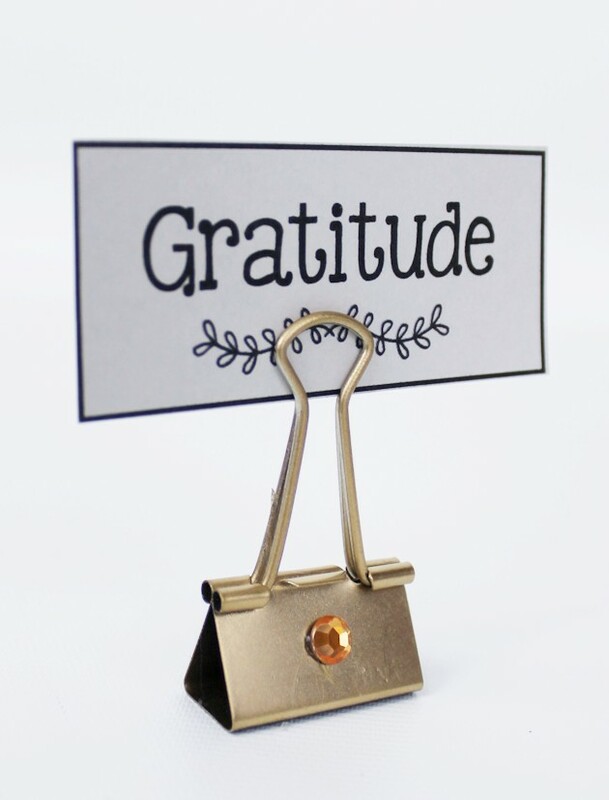 So many great ways to encourage us to be more specific in our gratitude. Many blessings to you! I love this idea. I will be doing this with my family in November. I love the adorable design as well. Thank you! You’re so welcome. Always glad to hear when someone finds something we’ve posted as helpful. Ü Good luck! Wonderful project and printable. I adore the repurposed binder clips. Thanks for sharing with us on the #HomeMattersParty this week. I hope you join us again next week. You’re very welcome Audrey. Glad you found it useful! This is a great tool. Gratitude can change the heart. Somedays I sure could use that help! I’m dropping by from the Friday Frenzy link party. I’m so glad that you shared this — it is wonderful! I have a link party that I am trying to grow. I invite you to share this idea (and a couple of others) because I think that my readers would enjoy this recipe as much as me. Party in Your PJs is my link party on my site Grandma Ideas at http://grandmaideas.com. It runs through Sunday night at midnight. I have 4 other co-hosts for the link party so your links will be seen on all 5 websites! I hope to see you at my link party. Love the printables. Thanks for sharing with us at the #HomeMattersParty link party. Thanks so much Alayna. I sure appreciate you sharing it. I’ll check out your page! Thanks for these cute printables! I totally need to do this.. what a great way to remember all the wonderful things that we have in this life! You’re very welcome Cami. I hope its a fun process! Previous: Small Photo Chest Makeover : Buff Your Stuff Cheap Decor Ideas!